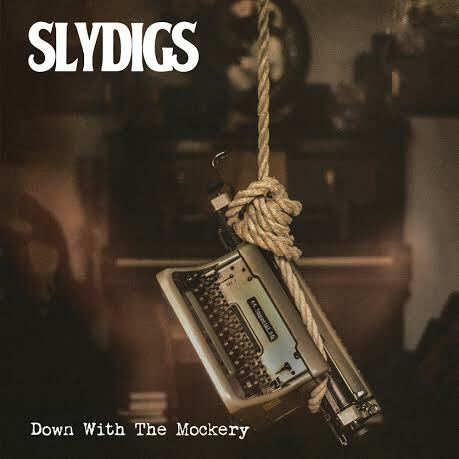 Slydigs are a blues-garage-rock band from Warrington, whose striking riffs and vivacious vocals make them a powerhouse of talent. With a high voltage of energy, Slydigs are a great reminder of old school blues-rock that has been air-lifted to create a contemporary soul stomping soundscape. 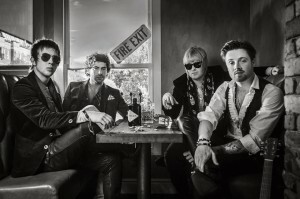 With Dean Fairhust on vocals/guitars, Louis Menguy on lead guitar, Ben Breslin on bass and Pete Fleming on drums, Slydigs are a fantastic band whose musical prowess benchmarks new-wave rock. With remnants of The Black Keys, T-Rex and The Rolling Stones, Slydigs effortlessly crossover into jazz, alt-country and folk without shouting it from the roof-tops. 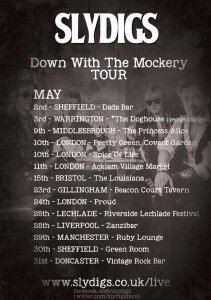 Having performed at Petty Green and The Night and Day Cafe Manchester, Slydigs have embarked upon a UK/overseas tour to commemorate the release of their new EP, “Down With The Mockery”. Released on May 25th, the EP was produced by George Shilling who has worked with Primal Scream, Ocean Colour Scene and Slade and will be accompanied by a documentary narrated by Howard Marks (Mr. Nice). With it’s opening riffs, “Get on it” awakens, reverberates and crashes amongst the hazy haven and gallops towards a sun-drenched horizon. It’s a brilliant first track, which sets the tone for this explosive and impressive debut EP . With its raw vocals and bluesy garage rock infused riffs, “Get on it” would sit nicely as a bonus track on The Black Keys’ El Camino. It’s a real corker whose rhythmic twangs are like solar flares burning against the tightly gripped rumbling riffs. Along with its subtle toe-tipped trumpet and glockenspiel clangs, “Get on it” delves back to its blues-rock origins, wearing its 60s emblem with pride. What’s great about “Get on it” is its virtuosic guitar playing that pulsates with a vigorous force whilst providing the perfect backdrop for Fairhurst’s raucous vocals. “Stiff Upper Lip” is the sort of anthemic song that would excel at a live gig or in a wide-berth arena that would allow its magnitude to shine. It’s a fast mover that pulls out all the stops to deliver its intoxicating mix of bluesy rock jazz. Through its jovial handclapping and space-glockenspiell “Stiff Upper Lip” exudes a sprightly charm aside the curving and choppy riffs. Through its infectious chorus “Stiff Upper Lip” morphs into a virile jam of looping riffs that unleash a parade of slamming piano, smudgy saxaphone and wayward trumpet, creating a celebratory, head spinning sound. With its stripped down acoustics and bare vocals “Soul ain’t safe around here” evokes a real sense of melancholy which is intensified through the heartfelt lyrics. A beautifully crafted song “Soul ain’t safe around here” aches with emotion whilst presenting an immaculate and polished production. With it thumping beats, reverberating riffs and sweeping violins “Soul ain’t safe around here” glides with a wistful ambience that has all the makings of a contemporary ballad. That Kinda Woman flirts with glam rock whilst staying loyal to its bluesy rock roots. It’s a sassy number whose robust riffs synchronise with the megaphone vocals and ratatap beats. It pulsates with a sexed up energy that staggers and swoons with an ardent blend of Jagger swagger. It’s a seductive preener that re-energises and jolts through its impressive guitar dexterity It’s also a song whose double whammy of hammering pianos and scribble riffs submerge you in a climatic frenzy. With its folk, bluesy, alt-country acoustics, “The Art of Self Destruction” wouldn’t sound of out of place in the outskirks of Oklahoma or Nashville. It’s an exquisite song that reaffirms Slydigs as a diverse and musically accomplished band. Lyrically raw, “The Art of Self-Destruction” wears its wounded heart on its sleeve whilst emitting a pensive soundscape. With its curling riffs, “The Art of Destruction” evokes a sense of sorrow which lays bare the sentiments of the song. Along with its elevating violins, “The Art of Self-Destruction” gleams a prism of light like a new dawn rising amongst its darkest hour. 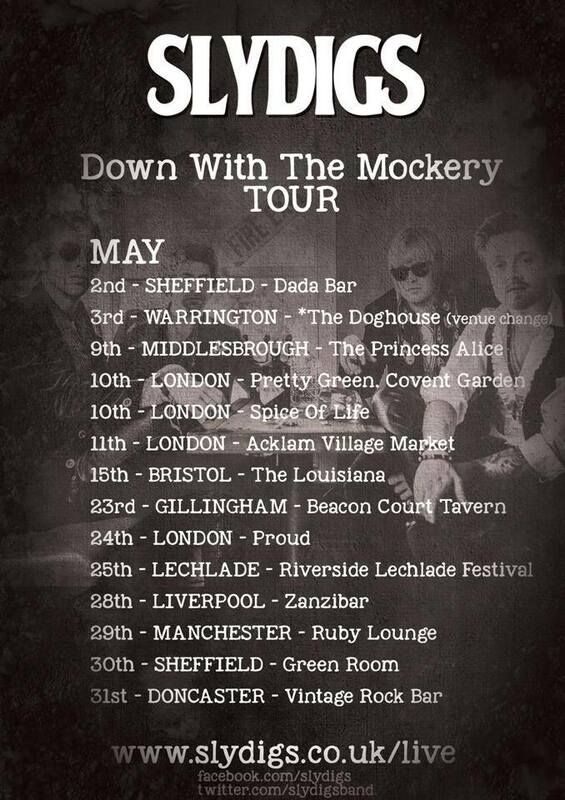 “Stiff Upper Lip” is the first official single of the EP and will be available to download on May 25th. The video is directed by John Corrin at Wasp Videos who worked with Howard Marks on the UK Tour documentary.